According to a news report from Defence24.com, the Polish Army is interested in buying more Leopard 2 main battle tanks (MBTs). Poland originally received 128 Leopard 2A4s for an extremely low price, a decision made in Germany in order to build up better political relationships between the two countries, which previously due to the second World War and previous conflicts had been terrible. A further 119 Leopard 2 tanks (including 105 relatively modern Leopard 2A5s) were ordered in 2013, after Germany (falsely) decided to downsize it's tank force. These second-hand tanks also were extremely cheap, costing only €180 million. 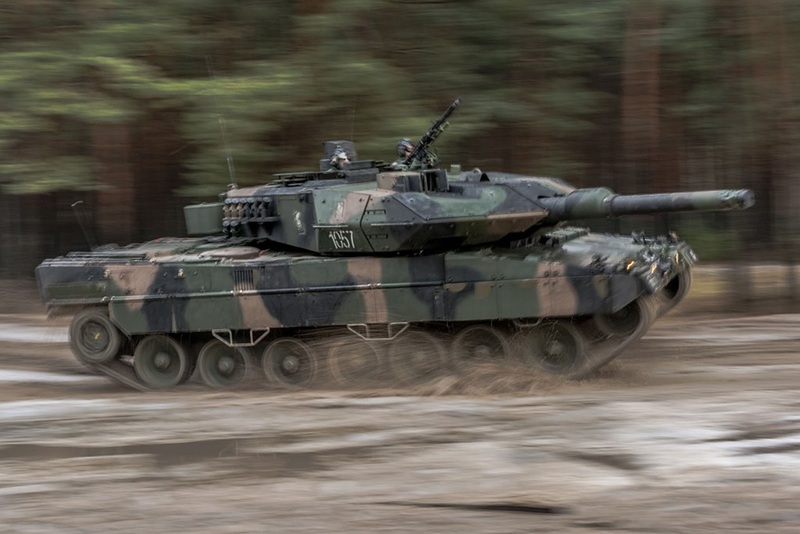 Given this history, it seems very unlikely that Poland is going to order newly built Leopard 2 tanks, which would cost between €5 and €11 million per vehicle, depending on variant and other parts and services being part of the contract value. Buying new tanks also would delay the introduction into service by some years, however the tanks could be more capable than what currently is possible with upgrading older vehicles - in order to keep upgrades cheap, most Leopard 2A4 users try to limit the weight of a modified version to 60 metric tons (above this limit the torsion bars need to be replaced, which requires some welding on the hull). Thus Poland is most likely looking to buy second hand Leopard 2A4 tanks for a much a lower price - before Russia annexed the Crimean peninsula, used Leopard 2A4 tanks were sometimes sold for less than one million Euros per tank. If Poland purchased Leopard 2A4 tanks, these MBTs then should be upgraded to the modern Leopard 2PL standard, which features enhanced surivability, firepower and slightly improved mobility. A thick AMAP composite armor module at the turret front boosts the frontal turret protection to a level comparable to the Leopard 2A7, while optics and modifications to the gun, improved drive system and a computer unit to program the 120 mm DM11 HE-airburst ammunition boost the tank's lethality. A third option for getting Leopard 2A4s at a low price might be Spain. Originally Spain leased 108 Leopard 2A4 tanks from Germany, which later were purchased by the Ejército de Tierra (Spanish Army), after Germany had downsized it's own military significantly and had no need for further tanks. 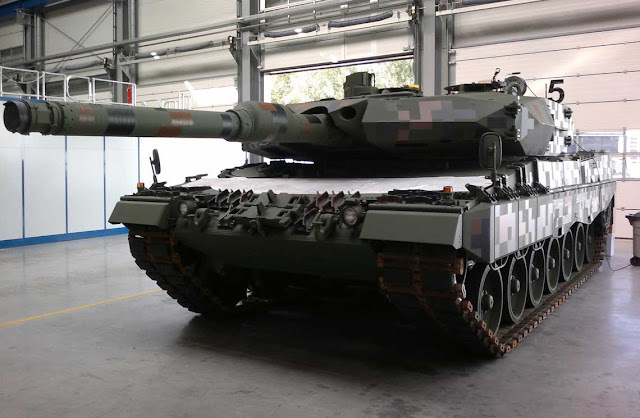 Spain has offered the tanks to the Czech Republic and to Peru; however they were rejected due to being in a bad condition and thus requiring costly factory-level maintenance. It is currently unknown what buying more Leopard 2 tanks means for the fate of the PT-16 tank developed by the Polish industry. It might result in no PT-16 being bought by the Polish Army, however the current government plans to increase the size of the military dramatically (together with it's budget), which might allow to upgrade some of the older T-72 and PT-91 tanks to the PT-16 configuration. Due to Russia's politics towards Eastern Europe (predominantely annexing Crimea and supporting the rebels in the civil war in Ukraine) being considered an aggression and inacceptable, NATO has increased it's focus on conventional warfare, shifting away from focusing on international peace-keeping, peace-making and anti-terror operations. To react faster and better in case of a Russian aggression, the Polish Army has moved some of it's currently most advanced tanks - the Leopard 2A5 - closer to it's eastern border. The tanks originally belonging to the 34th Armoured Cavalry Brigade located in Zagan (a city close to the German border) have been moved to the 1st Tank Brigade, which is stationed in Wesola, a place close to the country's capital, Warsaw. 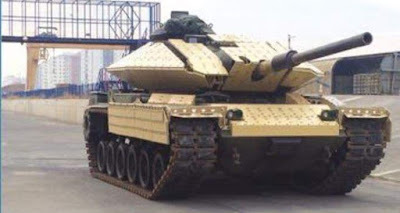 Likewise the PT-91, an enhanced, local version of the T-72 featuring ERAWA armor and improved electronics, will be used to replace some other tanks in the 1st Tank Brigade. Previously the unit was equipped with obsolete T-72M1 tanks. Meanwhile ADS Protection GmbH, a German company owned by Rheinmetall Defence and it's partner IBD Deisenroth Engineering, has suggested to the German military to adopt it's Active Defence System (ADS), a box-based active protection system (APS) capable of defeating (depending on exact variant) anti-tank guided missiles (ATGMs) - including top-attack weapons, RPGs, EFPs, aswell as HE(AT) and APFSDS ammunition fired by main battle tanks. A report following an investigation on the system was presented to the German Defence Commitee at the end of March. Due to the commitee working in private, it is not known what the result of this report are. According to an earlier report in a news magazine, the system could enter service in 2018 or 2019, when ordered in 2017. The system manages to exceed the NATO STANAG 4686 requirements for active protection systems (intercepting more than 85% of incoming projectiles for a reduction in penetration capacity by 50%), defeating over 95% of incoming threats during testing. On the 26th April of 2017, the German parliament finally approved a contract to buy and upgrade 103 Leopard 2A4 tanks, which are currently owned by the German defence industry. Previously the contract was delayed due to disputes between the two companies Krauss-Maffei Wegmann (KMW) and Rheinmetall, which could not agree on how the contract value would be split between them. Most of the tanks will be upgraded to the new Leopard 2A7V configuration, an upgraded variant of the Leopard 2A7, while the other tanks will be converted to support vehicles or repurposed in another way. The Leopard 2A7V will feature a stronger 20 kW auxiliary power unit (APU), enhanced armor protection, superior optics and improved communication systems. It might also feature the improved L/55A1 tank gun, that allows to operate at higher pressures. 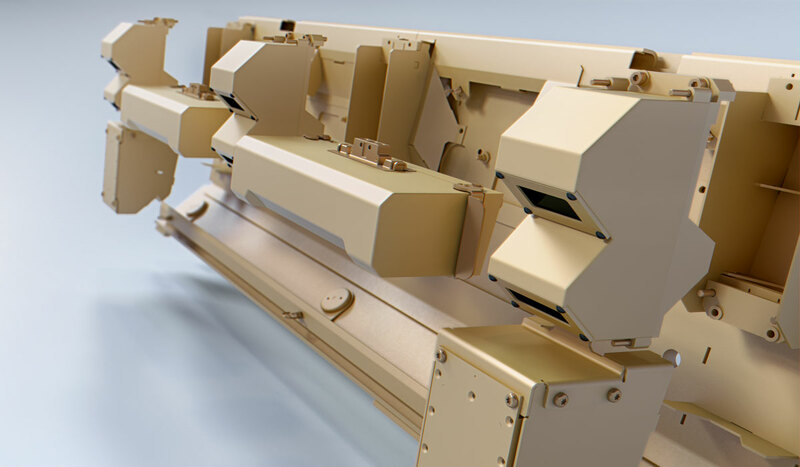 Together with new ammunition, this is said to improve performance/penetration by 20% compared to the current gun. After loosing several Leopard 2A4 tanks in combat against terrorists, Turkey is trying to improve the protection of the tanks. Depending on production batch, the 2A4 version of the tank is either fitted with a first, a second or a third generation armor package. 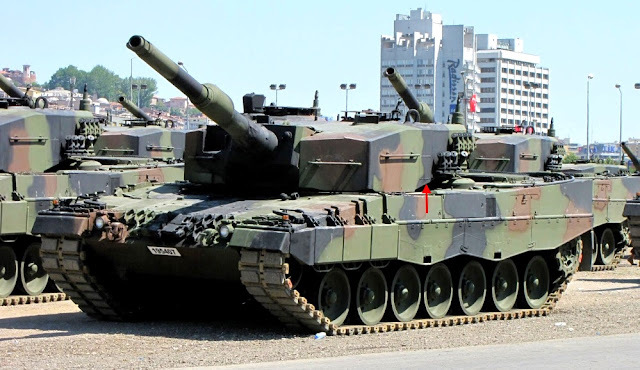 At least some Turkish Leopard 2A4 tanks are most likely fitted with the oldest and weakest armor option, because they belong to the earliest production batches. These can be identified by the ammunition hatch located in the left side wall of the turret; it was closed (by welding steel ontop of it) when the tanks were upgraded to the 2A4 configuration. According to the Military Technology Magazine, Turkish sources claim that a about 80 MBTs were used in the operation "Euphrates Shield", of which 43 were Leopard 2A4 tanks. Based on available data about 7 to 14 Leopard 2A4 tanks were hit by anti-tank guided missiles, damaging or destroying the tanks. Due to IS propaganda filming the same tank from different angles and pretending that this would be different vehicles, the exact kill number might be inflated. Currently 40 Leopard 2A4, 40 M60A3 and 120 M60T MBTs of the Turkish Army are planned to receive an upgrade to improve the protection against ATGMs, after two M60T tanks were already fitted with a remote weapon station (RWS) and laser warners. The M60T is meant to receive an active protection system; given that the Akkor APS is still in development, Turkey plans to buy an existing system. Furthermore the M60A3s and Leopard 2A4s are to be fitted with a new ERA kit from Roketsan (scheduled to be tested on a Leopard 2A4 first), a fire supression system, a close proximity surveillance system and the same upgrades as the two M60Ts received (which are laser warners and a SARP RWS). The upgraded Leopard 2A4 tanks are also meant to receive an APS, just like the M60T Sabra tanks. Which APS will be chosen is unknown, but Rheinmetall has complained about Germany blocking several weapon exports to Turkey; this might include the AMAP armor package used on the Turkish Leopard 2NG upgrade and/or the ADS active protection system. The Leopard 2 tanks from Germany, Denmark and Poland did enjoy great success in the Strong Europe Tank Challenge 2016, hosted by the US Army on the Grafenwöhr site located in Germany. This year's competition is scheduled to take place between the 7th and 12th of May. Denmark, Italy and Slovenia won't return after participating last year, however Austria (with Leopard 2A4s), France (with the Leclerc MBT), Romania (with the TR-85M1) and Ukraine (most likely using an upgraded T-64 version) join last year's competitors Germany, Poland and the United States. Let's see how the Leopard 2 can handle the Strong Europe Tank Challenge 2017. The war in Ukraine is not a "civil war". Would you name Finnish Winter War in the same manner? You are probably right, but finding a term that doesn't insult any reader is possibly impossible. I just remove the "civil" then. I would call it a war between the US installed and supported Kiev junta and Russian supported eastern Ukranian Donetsk and Luhansk regions. It is a proxy war initiated by the US funded and orchestrated coup in Kiev back in February 22/23, 2014. The coup you mean:Russian puppet impeached by Parliamentary vote? Yanukovitch was as much a Russian puppet as the North Koreans are a puppet of China. So now we have anti-Russian US puppets in Ukraine. I guess this makes the entire situation in Europe better because the US knows best what is good for Europe and the rest of the world. Better than let Putin recreate old Soviet client states in the west. Those state won't forgot how the Stalin exploit the opportunity of WW2 and expanded its empire into west. Norway has closer to 46 operational Leopard 2A4NOs. 52 is what we ordered, but 6 of the MBTs are cannibalized for parts. I have heard plans of "swarm tactic" using snowmobiles and high mobility to penetrate and flank enemy armored vehicle, using mines and AT weapons to take out the AFVs that are forced to follow certain paths. I have also heard rumous about replacing the Leopard 2s with 120mm armed CV90s, but I have not heard any official statement about it. Also, do you have any more info on the Leopard 2A4s in Turkey that are supposed to be equipped with ERA? Won't they be the first Leopard 2s equipped with ERA? Edited the post. Thanks for the info!
" - before Russia annexed the Crimean peninsula" You must mean before the US funded and orchestrated a coup in Ukraine to install an Anti-Russian government in Ukraine. A move by the US and certain other bad actors that not only violated Ukraine's sovereignity but also international law. It is interesting that practically all US or western controlled main stream media outlets just totally ignore that fact, like it never happened LOL. This act of aggression by the US just happened to have initiated the Ukraine crisis. Maybe its time for Russia or China to install some Anti-American puppets in Mexico. I am pretty sure the US would be totally ok with that. Or maybe Russia should install a missile "defense" system in Cuba again. Unfortunately even the non-political blog couldn’t immune from Kremlin agents. They infiltrated every corner of the Internet for beatifying the aggression history of the Russia. International law is unambiguous on how countries should decide the fate of disputed territories like Crimea. Countries can acquire territory by discovering uninhabited land, signing a treaty – as with Khrushchev’s transfer of Crimea to Ukraine in 1954. The legal methods for resolving questions of sovereignty are founded on widely recognized principles of international law but do not include, and have never included, a simple referendum of people living in a contested territory. If your so-called Crimean referendum were the right way to decide these issues, Russia ought to be holding a referendum to determine the future of Chechnya as well. China never aggressively annexed territory from its small neighbor nations, instead historically Chinese dynasty preferred to build a Tributary Relationship which based on mutual trading relationship. Unlike its north neighbor which illegally occupied outer Manchuria and separate its Mongolia brother from it. I see we have a wannabe Neocon/ Neolib US state department troll trying to obfuscate the facts again. Either way, it doesnt not remove the fact that the US medled once again in the affairs of another country by funding and orchestrating an illegal coup in Ukraine. You must have just conveniently forgotten about the "F**k the EU" Nuland-Pyatt Conversation back in February of 2014. Where Geoffrey Pyatt and Victoria Nuland discussed their pics to head the government of Ukraine. Or the Oleg Tsarov Speech in November of 2013 warning his Rada members about the US attempt to overthrow the unpopular yet democratically elected government. You must have also missed Victoria's Nuland Speech in December of 2013 where she told her donors and sponsors that the US invested 5 billion US dollars in the past 24 years to bring "democracy" to the Ukraine. You also must have overlooked the Ashton-Pait conversation discussing the mysterioUs events on the Maidan and the snipers. Very convenient but not surprising for a wannabe US State Deparmtent apparatchik just to ignore those details in order to blame the Russians (or pretty much anyone else that does not follow US interests or has their own interests)on starting this mess. I am not really surprised at all. So that’s how you rebute with dissents by opening in rhetoric crap then throw these fabrication based on information spied from Russian intelligence & propaganda media? Those leaked conversation concern little about US/EU attitude toward Russian aggression, the only thing you may dig from it is that how incompetent as assistant of secretary department under the Hillarie’s term. Nuland later had apologized for her remark and resigned after Trump get to the power. Since you had assume that there so many “missed story” in here, I suggested that you may well forgot how many journalists & protesters were beaten & killed by the SBU and Berkut forces during the protest? Have you heard that the RT anchor Liz Wahl resigned on air because heavy state funded media institution censored her interview about “Russia's intervention in Ukraine”? Why Russian rebuke push for UN tribunal that proposed from Malaysia to prosecute those suspected of downing a passenger airliner 17 despite it gained a majority on the Security Council? You can keep go on whatever you want, while try to buy the higher moral ground for the expansionism by comparing who is less evil is absurd. BTW your list is only exposed that you lack the basic conception of international law. According UN Commission "Aggression is the use of force by a State or Government against another State or Government, in any manner, whatever the weapons used and whether openly or otherwise, for any reason or for any purpose other than individual or collective self-defence or in pursuance of a decision or recommendation by a competent organ of the United Nations"
Since Soviet-backed communist force during the Chinese civil war was not recognized as legal government by the UN until 1971. Before that year, Republic of China lead by the KouMinDang was still been treated as sole representative of China in UN. Same as those separatist state in South Ossetia, Abkhazia in Georgia and Donbass area of Ukraine. US didn’t deploy any force during the incident, in contradict to Russian who not only provoke the separatist movement in these area but also directly intervention with its own armed force. US indeed intervened with many countries during its history while unlike Russian/Soviet it barely for territory greedy and ethnic group displacement despite Russian Empire had already seize most vast territory on earth after 19th century. The history are always likely to repeat again and again, those so-called “fact check” from your chauvinistic Russkie are remind me when Hitler invade Poland & Czechoslovakia in 1939, Nazai media propagated the invasion is “self-defense of Aryan group in foreign land”. "Finland might also be able to sell slightly less than a hundred Leopard 2A4 tanks, after purchasing 100 ex-Dutch Leopard 2A6 MBTs in 2014. Some of the 139 Leopard 2A4s originally bought by Finland have been relegated to reserve units, while others were converted into bridge layers, support vehicles or cannibalized for spare parts." I think this is highly unlikely, the Finns are good at finding second hand equipment in fair shape and buying at a good price and not selling it while it'sstill useful. I think the purchase of the Dutch tanks merely will slow down the rate of modernisation of the 2A4:s. Besides, didn't the Dutch alter the deal somewhat and chose to keep one company's worth (16-18 pcs) to keep the competence of armoured warfare in the army? Btw, don't the Swiss have around 190 unmodiefied 2A4:s in storage,that might be for sale? Roketsan should replace turret with newer one so that the tank wouldn't look ugly. Come on..... look at that. I'm sure the Turkish Ministry of Defense doesn't like it.